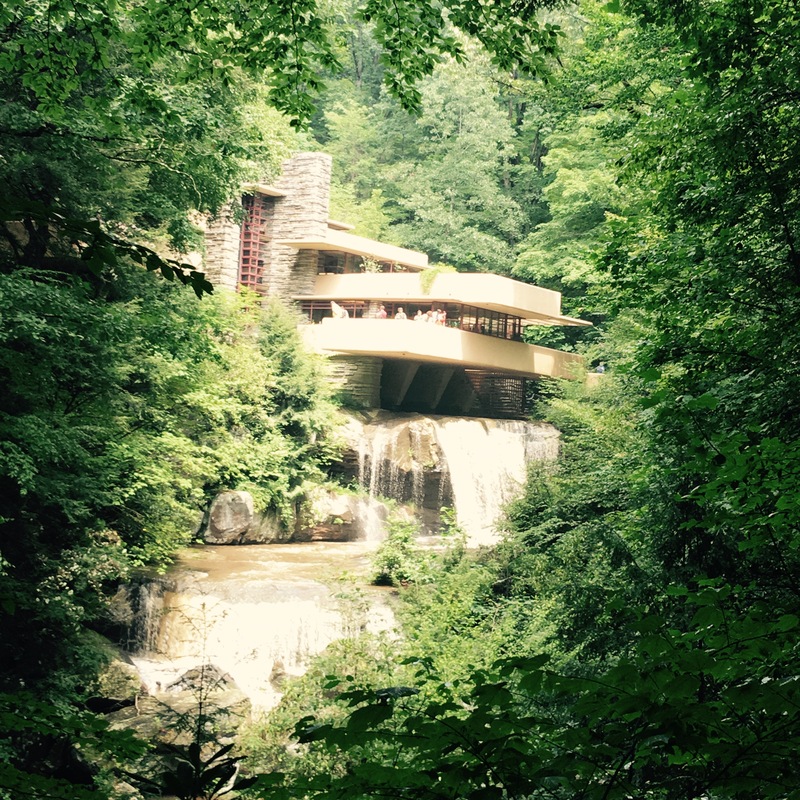 During a recent family reunion we all trekked to see Fallingwater – up close and personal. It is off the beaten path – but no too far off. The walk is fairly easy and well worth it, even during damp and rainy weather – as we saw it. Be prepared when visiting Fallingwater. No backpacks or large purses allowed. Photos are ONLY allowed outside unless you book the photojournalist tour. (Sadly, I missed that memo.) However, I didn’t feel too cheated as the exterior of the home presents like a photo bonanza. 2. Walking to and from the home is a lovely hike. The trail is paved. Bring bug spray – just say’in. 3. The waters flow beneath the home – yes I said BENEATH the home. Windows of varying types can be opened to allow for natural air flow. In the living room you can literally open a window and “fish” for dinner! The rock formations are integrated in to the building of the home. Walls are actually rock formations. The furniture is largely “built in” and all has the classic Frank Llyod Wright signature. 4.When you first see the home you notice there are three levels. What you don’t see is that there is a separate guest residence in the back. This home was estimated to have cost in 1930’s economic times $25,000 ,but ,after the total project was completed in 1941 it racked up a final cost of $155,000! On a positive note, many people who were unemployed due to the aftermath of the great depression and other economic downturns were given work. 5. When the formal tour is completed you are offered the opportunity to walk about the property on the hiking trails. 7. And, just when you think you have seen all the little treasures at Fallingwater you spot a bird nest nestled between the rocks of the home. I will leave you with a last look at the stream that brings Fallingwater to life!